Journalists and media owners across Africa have honored a jailed Ethiopian journalist, Woubshet Taye. In a statement extended to the Sudan Tribune on Wednesday, the Committee to Protect Journalists (CPJ) said Woubshet Taye was honored during the African Journalist Awards 2013. The journalists' wife and son received the award on his behalf at a ceremony held on Saturday in Cape Town, South Africa. Comprising a panel of 10 independent judges, the CNN MultiChoice African Journalist Awards was launched in 1995 and has since been held yearly honouring journalists in recognition of their contribution to a free press in Africa despite the risks they face. Woubshet, deputy editor of the Awramba Times, was detained in June 2011 on terror charges. He is currently serving 14 year jail term after he was found guilty in January 2012 under Ethiopia's controversial anti-terrorism law. Following his arrest the paper's editor fled into exile and the privately run paper was banned from publishing. Similarly, prominent Journalists Reeyot Alemu and Eskinder Nega are serving a 5 and 18 year jail terms respectively on terrorism related charges. "Journalists like Woubshet Taye and his colleagues Reeyot Alemu and Eskinder Nega should be out of prison and working to build the prosperity and the freedom of a new Ethiopia" explained judges at the journalism award adding " This award is in recognition of Wubshet's work and in solidarity with his condition"
According to CPJ sources, Woubshet's application for a presidential pardon was rejected in September. After receiving the Award, his wife, Berhane Tesfaye, said "her husband was grateful for the solidarity and received the award in the name of all journalists who are oppressed"
Meanwhile a newspaper editor for the independent weekly, The Reporter, Melaku Demisse, was last week arrested and briefly detained by police in Addis Ababa. Demisse was picked from his office in Addis Ababa and taken to the Southern Nations, Nationalities and Peoples' Regional State (SNNPR) where he was interrogated by the regional police. "Demisse is freed after he was held briefly in custody in Awasa" The Reporter editor in chief, Amare Aregawi, told Sudan Tribune on Wednesday. Aregawi accused the police of illegally transferring Demisse to Awasa, the capital city of the SNNPR, some 250 km south of the capital, Addis Ababa. "It was up to the court's decision to transfer him to a regional state and not of the Police" he said. Desmisse was arrested after wrongly reporting about the dismissal of three SNNPR's vice-presidents. Following the publication, the newspaper has retracted the story and apologized. 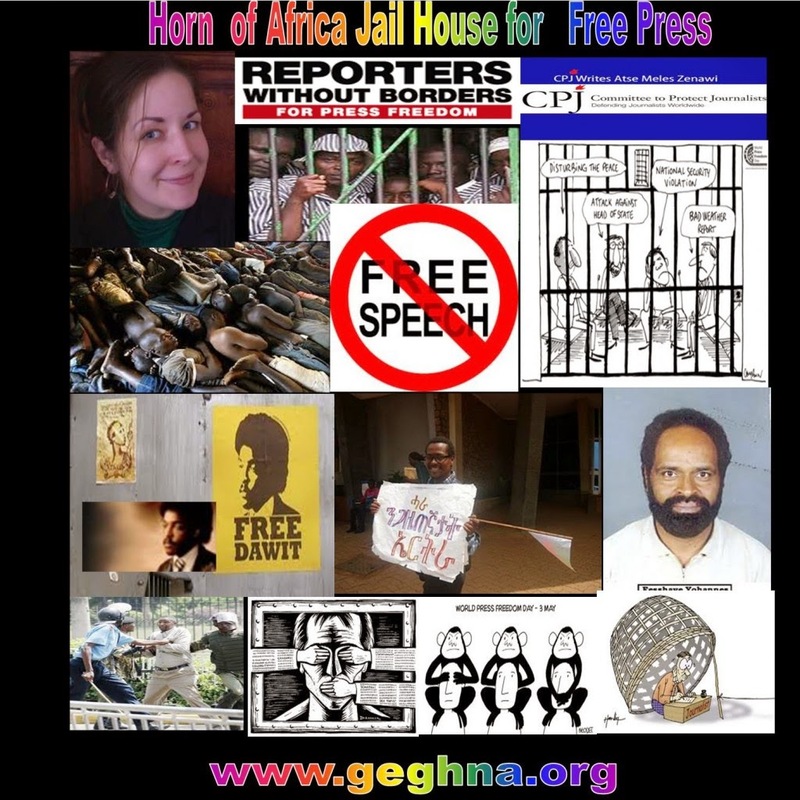 According to Reporters Without Borders press freedom index, Ethiopia is Ranked 137th out of 179 countries and is labelled as Africa's foremost jailer of Journalists next to neighbouring Eritrea. Reporters Without Borders is alarmed by newspaper editor Melaku Desmisse's illegal arrest in Addis Ababa by police from the Southern Nations, Nationalities and Peoples' Regional State (SNNPR) and his subsequent illegal transfer to Awasa, the capital city of the SNNPR. The editor of the Amharic-language version of the independent big-circulation weekly The Reporter, Desmisse was arrested for unclear reasons in his office on 9 October, taken to a police station in the Addis Ababa suburb of Bole, and from there was taken more than 250 km south of Addis Ababa to Awasa. "The Ethiopian government reminds the media of the law so often that it is incomprehensible that it is allowing the police and judicial authorities to flout the law in such a blatant fashion," Reporters Without Borders said. "The SNNPR police have no jurisdiction in Addis Ababa and it is completely illegal for them to seize a journalist working there. "If Desmisse is accused of breaking any law, he should be brought before a federal court in Addis Ababa, which alone has the authority to try him. In the meantime, we call for the immediate release of this journalist, especially as the reason for his arrest remains puzzling." Desmisse's arrest may be linked to the publication of an article on 4 September wrongly reporting the dismissal of three SNNPR's vice-presidents. The newspaper retracted the story and officially apologised on 8 September. No one has been able to contact Desmisse since his arrest and he is reportedly being interrogated by the SNNPR police. Owned by Media Communication Centre, the English and Amharic-language versions of The Reporter together constitute Ethiopia's leading independent newspaper, one that is often the target of intimidation. The newspaper's Amharic-language website, which gets up to 30,000 visitors a day, was blocked in April 2012. The Reporter editor in chief Amare Aregawi was illegally arrested and transferred outside Addis Ababa in August 2008. A few months after his release on bail, he sustained a serious head injury when attacked by unidentified individuals. When a black man is charged with a violent crime, what does a white observer see? What happens in the opposite case? How much more fraught is the act of interpretation, or judgment, when observing the actions of a person of another race or ethnic background? These are loaded questions, particularly in proudly multicultural Toronto, where Catherine Bush’s fourth novel,Accusation, begins. The novel opens with Sara Wheeler, a journalist covering “immigration issues and immigrant communities” for a national Canadian newspaper. She has become preoccupied with Raymond Renaud, Canadian founder of the internationally renowned Circus Mirak, an Ethiopian troupe whose oldest performers are no more than teenagers. At a benefit in Toronto, she (“tall and blond”) is introduced to Raymond, a “muscled, supple-limbed, pale black man.” Late that night, the unexpected occurs: A vulnerable Raymond approaches Sara with the proposal that she, a stranger, drive him six hours to Montreal so that Raymond can catch a flight. Intrigued, Sara agrees. In the protective darkness of the car, Sara tells Raymond about a pivotal episode in her own life: Years ago, she was accused of theft and fraud. Because of a lack of evidence, there was no conviction but, crucially, no exoneration. Sara believes that this false accusation is the truest thing she can confide. A persistent tapping at the complexities of prejudice – the accusations we harbour in our hearts – brings an unnerving friction to Accusation. I found it impossible, at various moments, not to judge Sara or to assign victimhood: In other words, to make my own dangerous accusations. Impulsively, Sara travels to Ethiopia to learn “who and what [Raymond] is.” If he has been wrongly accused, perhaps she can assist him. Yet her reasons are not entirely convincing, even to herself. Although Sara is an experienced journalist who has reported from conflict zones in the Middle East and East Africa, she seems ill at ease in the role of investigative journalist. She leaves a message with the local police in Addis Ababa, but never follows up. She shies away from pursuing the obvious leads, including contacting his friends and family at home. In these moments, Sara, as a character, feels tenuous. Still, through a network of expatriates, mostly Canadian, Sara discovers another story of sexual abuse, only tangentially related to Raymond, this time at an orphanage. On her return to Toronto, Sara publishes a major news feature, exposing a possible pedophilia ring in Ethiopia. The photograph of a 13-year-old victim, Abiye, is printed. Sara snapped the picture while in Ethiopia, and it’s never clear what kind of consent was requested or received. Meanwhile, nobody has yet been charged; accusations swirl. Bush’s prose is deeply considered, calm on the surface yet, on closer reading, full of ambiguities. A young man involved in terrorist activity is described as “angry in a more lethal way than [Sara].” In Ethiopia, Sara tells us, “How intimate, and domestic, the relationship with one’s driver could be.” Though the words are direct, the psychology underneath feels elusive. In her private life, coming to the end of a three-year affair with David, whose wife is undergoing treatment for cancer, Sara professes not to believe in truth, only in individual versions of the truth. Meanwhile, Raymond, projected upon, glimpsed as either a victim or a monster with little room in between, comes to life with a fractured, painful clarity. Events accelerate. Sara continues to pursue the story. At last, Raymond, heartbroken, begs her for peace: “You who know what this is like.” What’s left unspoken is that, in fact, Sara does not know: She cannot apprehend the nightmare of being a black man in North America accused of a sexual, predatory crime. Raymond’s truth remains hidden and unarticulated. The fact that Sara doesn’t perceive this divide is perhaps the most haunting conflict in Accusation. After the conversation with Raymond, she sees a group of teenagers trick or treating, one wearing a “pink Afro,” and she thinks, “She had once been a teenager like them.” This feels more real. The novel subtly evokes a deeper tragedy: In others, we keep seeing versions (fractured truths) of ourselves. Our projections become so vivid that, eventually, those unable to secure their own identities become invisible. Accusation is both a psychological thriller and a novel of anxiety: How can we interpret the actions of another if we are unable to perceive the most crucial elements? In the end, the inner life of another person might be the greatest mystery of all, especially if it was their exoticism that first attracted us. Our projections might blind us to the things every person holds in common: the desire to give love without reserve, the desire, perhaps impossible, to be seen fully, in our complexity, before the blade of judgment falls.